Released by Sega for arcades in 1981, 005 was the first stealth action-adventure. 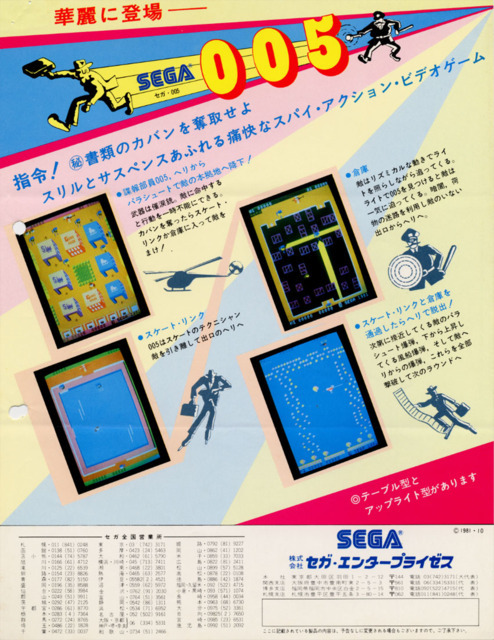 A spy armed only with a gas canister must avoid enemies as he explores an open-ended overworld with buildings and warehouses, where he must dodge enemy fla...MoreReleased by Sega for arcades in 1981, 005 was the first stealth action-adventure. A spy armed only with a gas canister must avoid enemies as he explores an open-ended overworld with buildings and warehouses, where he must dodge enemy flashlights and use boxes as hiding spots.